After rehearsals this week, and hearing Quincy Coleman live for the first time in my living room, I can’t urge you strongly enough to make the time to come out. You will be stunned by the artistry of her music and delivery. I’m truly humbled to share a stage with her. Quincy’s music has been heard on The Carson Daly Show, KCRW, Starbucks and TV & Film including her lullaby rendition of “Bridge Over Troubled Water” from Brothers & Sisters, “Give It Away” and “Baby Don’t You Cry” from Fox Searchlight’s acclaimed film Waitress. A stage 4 cancer diagnosis that reversed holistically, brought her back home to her soul. Quincy is the founder of H-OM-E, a place to create, educate and celebrate Consciousness & Unity, where Truth is One Paths are Many! Michael Mollura is going to set an intention for this night of sacred music at the Hotel Cafe. A little bit about Michael. He is a composer for film, TV, Theater, Dance and art mediums. He is primarily known as the composer for such spiritually driven feature films as Hare Krishna , Heal, the Highest Pass and Awake the life of Yogananda and the upcoming episodic tv drama Road to Dharma. Joey Lagussy will top off the night with soul stirring musical vibrations that will send you home in total bliss and joy! 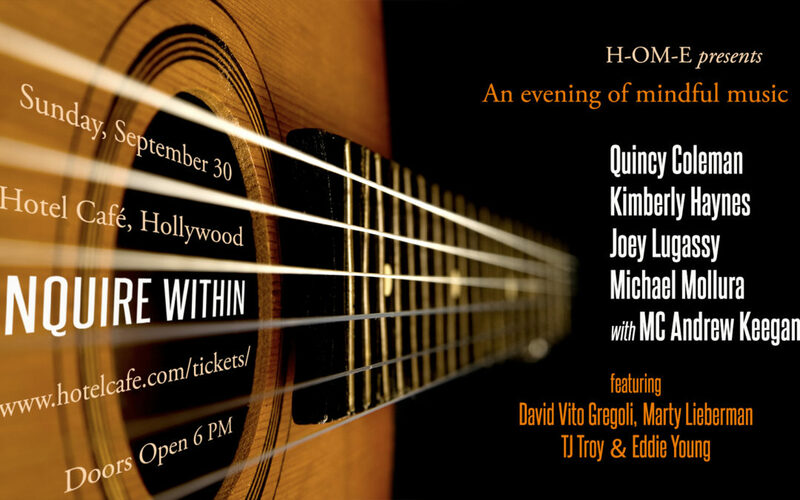 Joey’s singer/songwriter journey has taken him everywhere from front-man in London’s Prog Rock scene to singing on a mountaintop sanctuary for Zen Master, Thich Nhat Hanh, to receiving two Emmy nominations for best song in a drama series. AND its a red letter day as music-of-the-heart makes its way into the mainstream with The Hotel Cafe opening its doors to us. But – as we strive to bring non-sectarian, vibrationally elevated music to the masses, we can’t do it alone! We need you to jump in with us. Your attendance will make it possible for this to happen again – in bigger and bigger ways. So, change your plans if you can, and head on out to The Hotel Cafe tomorrow night. Here’s the link for tickets to support the AMAZING band including Vito Gregoli on guitar, Eddie Young on bass and cello, and TJ Troy on percussion and drums.